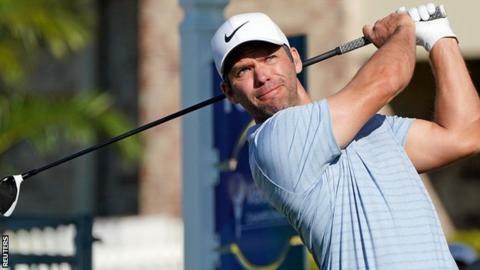 Defending champion Paul Casey shot a five-under-par 66 in the second round to take a share of the lead at the halfway point of the Valspar Championship in Florida. The Englishman moved to six under alongside American Austin Cook. England's Luke Donald finished his round tied for third with the United States' Scott Stallings and South Korea's Sungjae Im, one shot back. Casey edged out Americans Tiger Woods and Patrick Reed to win last year. The 41-year-old showed some of that form with a rapid start to his round, picking up birdies in three of his first four holes. He picked up shots on the par fives on his homeward nine, as he drained a 10-foot birdie putt on the first before landing a 27-foot attempt at an eagle on five. His solitary bogey came on the closing ninth after he found sand with his first two shots. Donald was briefly the on-course leader after a birdie four from home moved him to seven under but he missed a par putt from four feet on the next and dropped another shot on his penultimate hole. The 41-year-old last made a cut 376 days ago, at the Valspar Championship in March 2018, and has only made three PGA Tour starts since, as he has struggled with a back injury. Donald, who last won a tournament 2,560 days ago, is playing in only his second competition of the season. "Maybe I lost a little bit of focus down the stretch there the last few holes, but overall I'm in a great position and thankful that I feel good and healthy and ready for a weekend," said the former world number one, who is playing on a major medical exemption. World number one Dustin Johnson is a shot further back at four under, while Scotland's Russell Knox, who was joint third after the first round, fell away as a five-over round left him one over par overall.